Too much Polish Craft in fact. 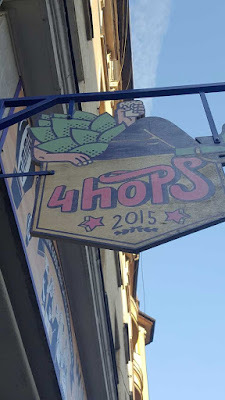 Hopping off the tram, considerably refreshed already, we made for 4 Hops in an area not far from the Old Town and very near our hotel. This was a busy and very pubby destination with a much more mixed crowd than the relatively young clientele at our previous location. That is, for once we didn't automatically double the average age of the customers on entry. I liked it for that alone. Here we bumped into some more of our crowd and were able to ascertain with a modicum of accuracy, where others might be. Of course we made no use of this information whatever and after a couple made our rather wobbly way to Marynka, Piwo i Aperitivo where more by the fact we all had the same maps, we did indeed find some of our fellow imbibers. Now don't get your hopes up here for a "aperitivo" meaning a sumptious Italian style free feast. Instead a few little tubs of this and that - think nibbles - were on the bar. Still, disregarding that minor setback and glancing at the beer list, I noticed my nemesis was beckoning to me once again. Yes Dear Reader, Strawberry Milk Shake IPA. She was as luscious and appealing as she had been earlier and in her enchanting way somehow buoyed me up for a later and un-needed visit to Stacja Pub - at least I think that's where it was. Either way it was heaving and had a great selection of Polish craft. I had something with Citra and something stouty, but things had gone well downhill by then. Of course it didn't end there though it should have. As we were just round the corner from our hotel, a quick visit to a rather posh bar was made, much against the will of a by then long suffering and reluctant E. Once in, having knocked my beer bottle over twice, even I knew it was time for bed. So what did I learn from this? Well, drinking lots of beer around 6% abv by the half litre over a long day is not really advisable. I should have known that really, but as they say, it seemed a good idea at the time. I am desperately trying to recall if we ate anything. I have a feeling we did, but I'm not asking E. That would be inadvisable. Thankfully I woke up with only the slightest of hangovers. A substantial breakfast and lovely walk in the fresh air with added culture, chased that, if not away, to a place that I didn't exactly notice. The next day involved Tankovna Pilsner Urquell. That was a good thing and I know I ate properly and drank a lot more wisely. Labels: Eating is Cheating, Poland, Polish Craft, Strawberry Milk Shake IPA. After our first night, it was up bright eyed and bushy tailed - honestly - yes - but that was the last of that joyous state. A very decent breakfast set us up nicely for a walk around the city - well some of it anyway - in beautiful sunshine and shirt sleeve order. It really is an impressive place and before joining the others, E and I poked around a bit. It really is amazing how the devastation has been seamlessly turned back into what it was (or near enough). Our walk sort of ended at the River Oder which in Wroclaw is spilt into several different branches. The main bit was very attractive with people out enjoying the autumnal sunshine, but inevitably as it was a beery mob I was with, we found ourselves in the huge covered market. Some of us wandered around gawping at venomous looking mushrooms, home made jams, impressive meats and sausages breads and vegetables - all the usual paraphernalia that such places provide. Of course there was an ulterior motive as some of the party, giving up any pretence, sought out our goal, Targowa a multi tap pub located "somewhere" in the market hall. Probably around ten taps or so of various Polish beers to go at. I had a very impressive Apatron American Pale, some New England Pale and a taster of a very fierce Habanero Oatmeal stout, which hadn't held back on the chillies. 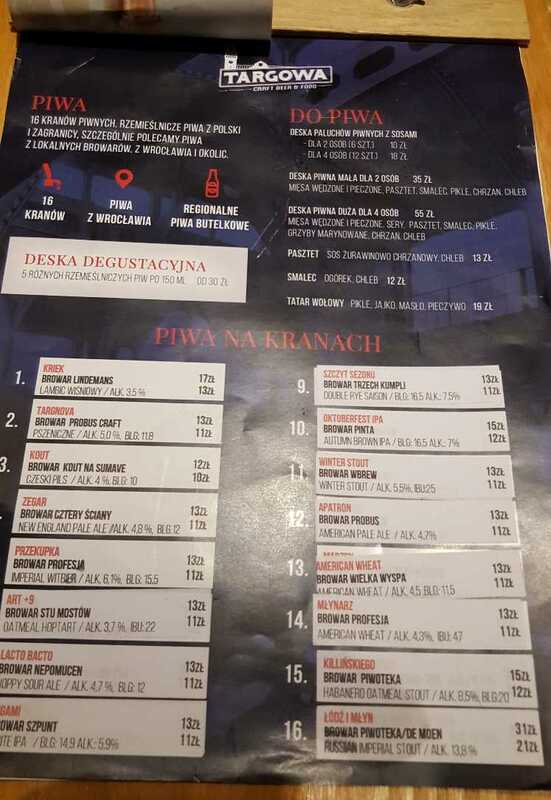 All beers were around 13 -15 zloty for a half litre or around £3, though the 13.8% Russian Imperial Stout was a whopping 31zl. The party then split up to pursue other cultural pursuits. Well I won't lie to you, to pursue other pubs. 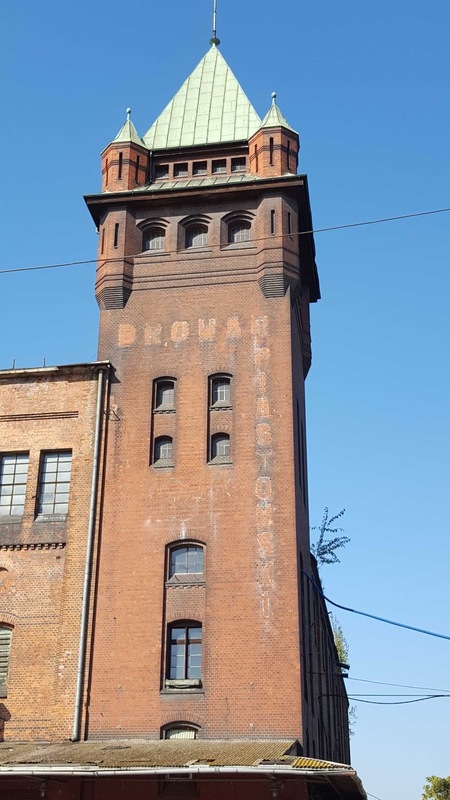 Five of us decided to walk to Browar Stu Mostów which was a simple enough feat as we just followed the tram line. A fascinating walk of around two miles took us up through an old tenemented part of the city, many clearly dating back to Kaiser Bill times (Wilhelminesche) with their elaborate wrought iron works and tiny balconies. Some were more modern where one assumes, destruction had occurred, though equally redevelopment could have been the cause. 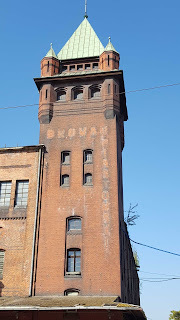 We also passed a huge empty brewery, its buildings still intact and the name, just about readable on the chimney. Awaiting development no doubt. Just over the river - the Oder again - a quick left and right and we arrived at our destination on the spot of its two o'clock opening time . Browar Stu Mostów is impressive as a venue. Downstairs, a shiny brewery of some size and upstairs, a rather small bar complete with a number of taps from its own brewery and elsewhere. Now it has to be said that we likely spent a bit more time there than intended and that wasn't good for us, though some of it was the wait to be served as the small bar got more and more busy, overwhelming the two or three staff. Additionally, each time we tempted to leave, some others from our party showed up. I started of with a Hefeweizen after the hot walk, I had Black IPA, then my nemesis. I discovered Strawberry Milk Shake IPA - brewed on the premises - and the rocky road to ruin was assured. I caught up with this lovely lady several more times elsewhere and she still held me in her thrall. An easy drinking 5.9% can be a hard mistress though as I subsequently found out, but she was so beautiful to be with. Needless to say, we caught the tram back and more Polish beer was to come, though my lovely lady was nowhere to be seen. Just as well, but she was waiting for me elsewhere. It was destiny. A word about Polish bar staff. All were most charming, male or female. English was widely spoken by the young. 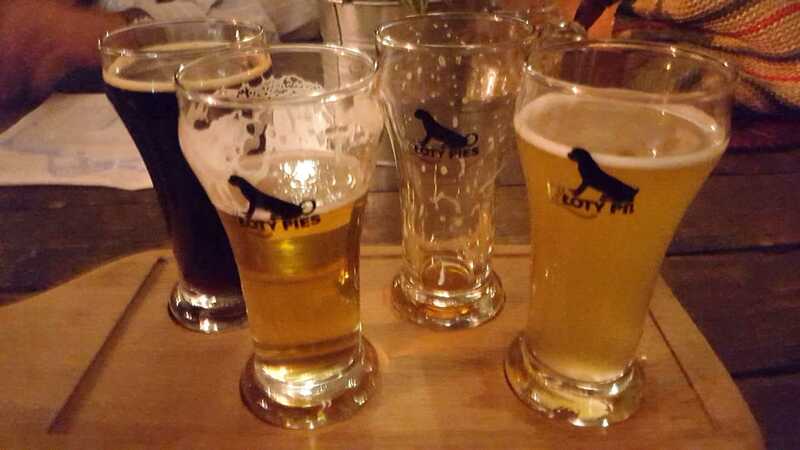 Most Polish Craft Beer places were more pubby and less bleak than many elsewhere, but many similarities were to be found. Few hipsters though. No I don't mean the Counting House in Glasgow, though you certainly can get it there, nor do I mean Drygate Brewery in Glasgow where you can also get it - more of that later - but I do mean Wroclaw in Poland where you most certainly can get it and in very nice surroundings too. Wroclaw is a Polish city in Western Poland. It used to be the German city of Breslau until after the Second World War when Poland was moved west and it kind of retains its German feel, though it was completely Polonised after the war after the German population was expelled. As Festung Breslau (Fortress Breslau) it was ferociously defended by the Germans and had the distinction of actually surrendering more than a week after Berlin fell. It was completely devastated, in its eastern areas particularly, by the advancing Russians and very heavily damaged elsewhere. You can see that today in the buildings, though the centre is wonderfully restored. It is also a very beery town indeed. We started off our wanderings on our first night there (we only emerged from our hotels around half past eight) with a meal and beers in Spitz, a grand cellar beer hall, very much in the German style, underneath the Town Hall. They allegedly brew there, but if they do, it certainly isn't on the kit on show in the main area. This looks old and unused. The beers are broadly German in style - think helles, dunkel, schwarzbier - and while soft and drinkable, lacked any real oomph. This was in a huge way made up for by the charm of the young waitresses and waiters who were eager to help with menus and explain the beers and by the general jolly beer hall atmoshere inside. The hearty food wasn't half bad either and the crowd, a lot of them young, made for a very convivial couple of hours. We had to wait for a table and we weren't the only ones, our spot being swooped on on our departure, as soon as our bums lifted from the seats. Just time for a couple before bed then. Next up was a much more modern affair. Browar Złoty Pies was just across the square and several of us congregated there. Translated as the Golden Dog, it had several dog themed craft beers on show and rare for me - I'm no ticker - I took the opportunity to have a sample tray. 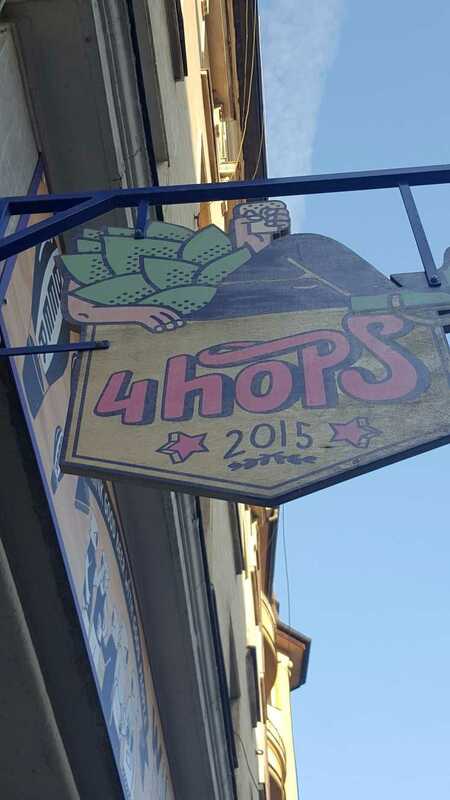 Four standard beers are produced on the premises and in addition, ever changing seasonal beers. Alas the passion fruit weizen had gone off but I enjoyed Setter Stout (maybe needs some work) the standard weizen was bang in the middle of the style, a perfectly decent Bokser Lager and the pick of the bunch, Pit Bull IPA which was American in style and pit bull like in every other way. It bit. The bar itself was modern, buzzy and if you are wondering about prices, under £3 a pint equivalent. Bar food is available. A good start, but Saturday was yet to come. That's when it really got going. This was a CAMRA trip. Around 25 of us, though we went around in groups rather than mob handed. E and I stayed in Hotel Puro, a boutique hotel which is handy and highly recommended. 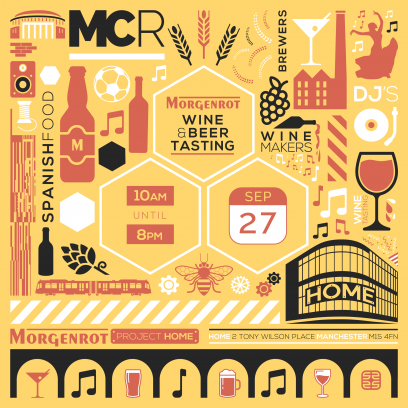 Given that to most minds Manchester is one of the foremost beer cities in the country with a great cask and craft scene, there are relatively few beery events held here by the trade. Well few that I'm invited to anyway. It was therefore welcome and unusual to get an invitation to a Wine and Beer Tasting by locally based importers Morganrot held on one of the upper floors of the very trendy Home Building in one of the more trendy areas of Manchester, Tony Wilson Place -'nuff said - which, needless to say, I don't know at all well. I took E along for support and had a look at what was on offer. A simple programme showed mainly Spanish beers with a sprinkling from Sweden, Germany and Malta. The noticeable thing about the Spanish offerings was their similarity. All seemed to have a Pale Ale, an American Pale Ale, an IPA, an Amber Ale and either a stout or a porter. Now this isn't a problem, but does make you wonder a little why you'd go to the trouble as a small microbrewer to export such universally available products. I guess the answer is, that despite the oddities of the beer world that we see so often, that's what sells. I tried most of them and it has to be said, though none were particularly bad, none really stood out. The pick of the bunch were the porters and stouts with a stunning cigar smoke smoked stout from oddly named Swedish brewers, Pang Pang and very competent offerings from others. For those interested in such things, Spanish brewers included Mala Gissona, Cervecera Artesana and LaPirata. I also had a very informative chat with the Krombacher folks and in particular liked their attempt at a Southern German Weissbier, though I doubt that they'll be trembling in their shoes in Bavaria just yet. Likewise Sleeman Railside Session Pale is not going to cause anyone producing a domestic bog standard pale ale to have sleepless nights over this tame offering and it does make you wonder about the wisdom of trunking this kind of stuff across the Atlantic, other than novelty value. So what do we learn? Craft beer is by no means exempt from "boring brown bitter" syndrome, dark beers often present better than pale and does anyone actually like amber ale? The best beer of the show? The delicious Cisk Lager from Malta, was honest, fresh and tasty and at the right price-point would be a great addition to certain outlets. That's the kind of beer that still really sells, but for complexity, the Cigar Smoke Stout pips it. For a different market of course. My thanks to Morganrot for a very entertaining couple of hours. E enjoyed the wine too. Lastly, we went after to Gasworks Brew Bar and Kitchen next door. I liked it and more of this later. 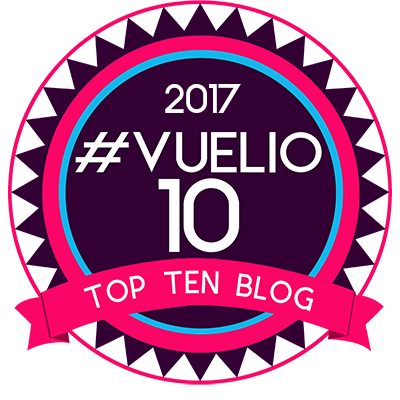 I've been busy and unwell, so this is a bit of a catch up. Outstanding Brewery used to be in my CAMRA Branch Bailiwick, but has recently moved from its rather old fashioned building in Bury to a new location in deepest Salford. They had a bit of an open day for CAMRA colleagues and their own friends and family a couple of Saturdays ago, so me and the boss went along. At E's suggestion we walked from Shudehill along the banks of the Irwell as this seemed an interesting way to go. That was easier said than done as we had to make frequent detours to avoid the intense amount of new builds along the banks of the river and further into the interior. It was fascinating nonetheless to walk in a part of the area that I don't really know and as a bit of a railway buff I really enjoyed looking at the work being done on the Ordsall Curve which will directly link Manchester's Piccadilly and Victoria Stations. After a couple of miles and an equal number of false starts we located the building, paid a tenner to charity and went in. Two rather large industrial units have been combined into one, divided by stairs to a podium with a bar and sitting area. 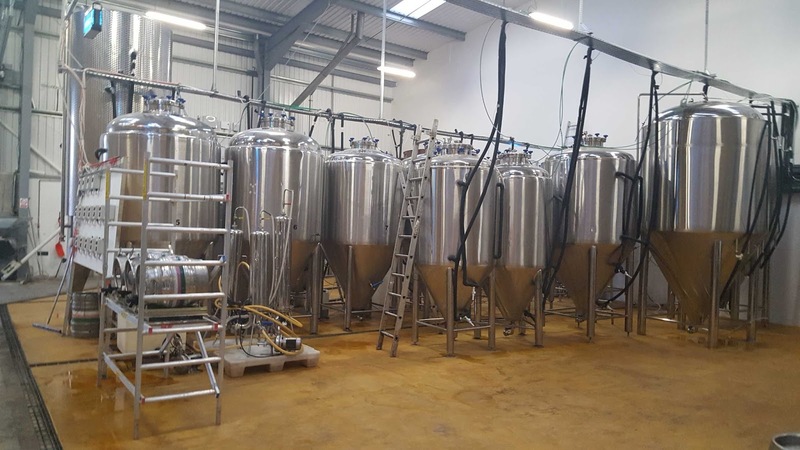 In the first of these units is Porter Installations the constructor of many of the current crop of UK microbreweries as well as an increasing number abroad. Run by the eponymous Dave Porter a brewer, brewery builder and much more, partly constructed brew kit could be seen, while Dave himself showing his other side, did the guided tour bit of the actual brewery, while the owner Glen, a brewer himself and ever amiable and I looked down from above. I am unsure of how ownership works out other than that each appears to have a small stake in the others business, while facilities are shared. Or it may be some other odd combination, but either way, it seems to work. The units have been purchased as the rental option was considered dead money. They are modern and flexible. I think Dave, as well as knowing everything and everyone, was an accountant. He'll have done the sums. That's a compliment. 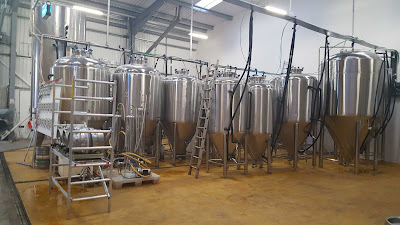 The brewery is large and fairly shiny and produces cask and keg beers. The bar dispensed several of each and while we both started off with a very, hoppy, light coloured Ultra Pale Ale - 4.1% I think, we ended up on Four, a clean, herbal, refreshing keg lager which shows what really can be done with this style. It is worth noting that while the keg lagers are filtered, none are pasteurised. Nice guys that I have known for years, doing well and producing great beer is all this is about. This is a simple good news story - apart from losing a great brewery from Bury that is. The charity tenner got us as much beer as we wanted and a pizza should one be desired, but as usual at these things, it was just great to chat to beery people and talk beer to brewers. We got the tram back to Central Manchester. In my usual cack handed way, I only took one photo. See the website linked above for more.